Resetti assured me that he put on his “nice hat” this time, and that next time I reset my game without saving, he would be wearing a different hat, so to speak. Ooh, a new house, which means someone’s moved in to replace Patty! Rod had the exact same house style and shape. The house belongs to Roald! So now I’ll have two jocks in Dafdilly. -_- He seems cool, though; I love his house interior when he unpacks, and it might be funny to hear a chubby penguin rant about muscles and working out. So much for there being no wrong answers on the path to self-discovery. 😛 Gotta love the snooty characters! I’m getting pretty good at recognizing the dorado’s shadow. How lucky! This is the one piece of furniture I’d been resisting the urge to order with my original character, who’s still preserved in my dad’s town. (I told myself that I wouldn’t use my original character’s money or catalog until I payed off my mortgage.) It looks much better in my fruit kitchen than the white kitchen appliances. Today I tried out the brown roof, but I don’t really like it. The cool medium brown clashes with the warm wooden brown, in my opinion. Fortunately, it’ll be red tomorrow instead! A good day for hybrids! I got my first blue pansy; I’m surprised it took this long since I’ve had white pansies arranged near the gate since my first night in Dafdilly. Peewee’s wearing my petal dress. xD I think I’d like to make more petal outfits, based on real flowers like roses or marigolds. Found Kapp’n at the Roost and he was full of compliments, as usual! A birthday cake? For me? You shouldn’t have! There was a Point Special today at Nookington’s, so I bought out the store and ordered from my catalog. 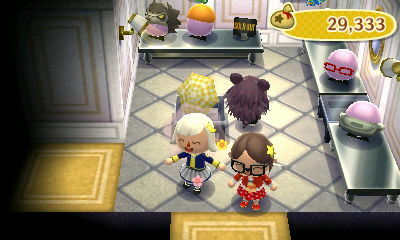 It payed off in more ways than one; my rooms look better now and I got the Nook ‘n’ Go model! I rearranged Harmony’s room a bit and added a holly bonsai, which looks kind of awkward at the moment. Her room will look better when I have more white/gold things to put in it, like regal furniture, a claw-foot tub, and some trophies. My improved fruit kitchen! The idea here is that you walk in, turn on the lamp and check the time, then either go to the right side to watch TV and listen to music, or to the left side to sit at the main dining area and make coffee/toast. 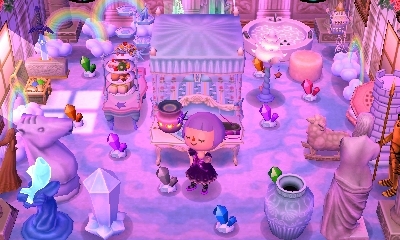 I like it better now, but it won’t be perfect to me until I get the apple TV and more fruit furniture/café items (I’ve had to resort to using the flower chairs). I also bought new beds for my characters. Twisk looks ready for her hammock! 😆 I’ll replace it with the mush bed when I get one, haha. 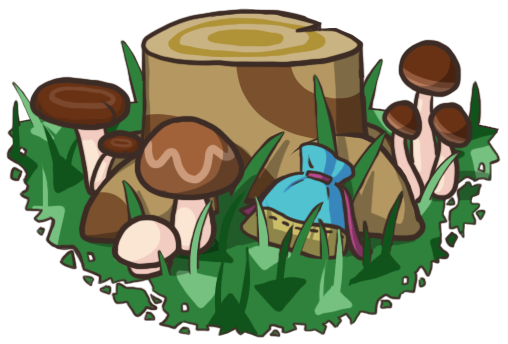 Posted on July 31, 2011 by Amy •	This entry was posted in AC:WW, Dafdilly and tagged Animal Crossing. Bookmark the permalink. I really like the rainbow with the “Animal crossing” sign. Its quite nice when they do fireworks with the sign too! 🙂 When I first started AC:WW, Roald used to be my “Favourite” but really I don’t care about him anymore. I have a tip: well, when I take pics of AC:WW stuff with my camera, I hold it about 5-10cm away from the screen, and I put my finger lightly on the take picture button, because with my =camera it normally focuses it, you should see how that goes. I had a bed just like yours! but my other charaters, Robin, Cherry, and Victoria, wel.. they had plain beds. I agree, I love the AC logo against a sky background in general 🙂 I think it’s unique to AC:WW, if I’m not mistaken. Because in AC:NL, AC:CF, and AC:GC, the Animal Crossing logo on the main menu screen is shown over a view of your actual town. The attic in AC:WW, and the way you could customize your bed, is a cute little feature I might miss a bit! I wish it was possible to customize the carpet and wallpaper as well, though. Me too! It’d be even better if you could put furniture in too.